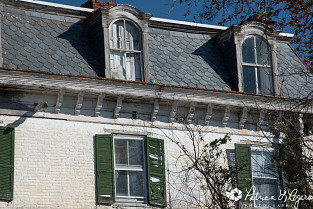 A dormer is a protrusion that juts out from a sloped roof, and has a mini roof of its own. Not only does a dormer add beauty and classic elegance to a home, it also creates space and headroom. 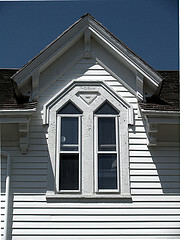 If windows are installed, as they usually are, the dormer provides another advantage -- additional light. Dormers are commonly added when performing a loft conversion, but any space above the first floor of your house can benefit from them. A gable dormer is the most common type, which goes well with a wide variety of architectural styles. It has a peaked roof, sloping down on either side. A flared dormer is a gable dormer with a roof that flares out in order to shade the window from the sun's heat and glare. Great for southern and western exposures. An eyebrow dormer has a low-curved roof in a shape that looks like an eyebrow, and was popular in late 19th century architecture. 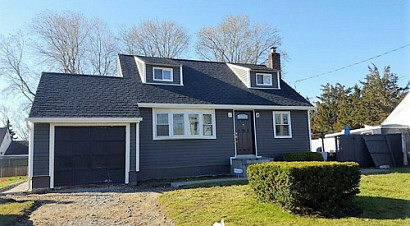 A hipped dormer has a roof that slopes back on three sides, meeting at a recessed point. An inset dormer – as opposed to other dormers which extend out from the roof – is set back into the roof, leaving a flat, horizontal space between the bottom of the dormer and the rest of the roof. A flat dormer has a flat, non-sloping roof. A shed dormer has a roof with a single sloping plane, usually at a shallower angle than the main roof. A wall dormer is a less-common dormer and offers little additional space. Its face is part of the regular wall, but has an elevated vertical roof that projects above the rest of the roof. A link dormer is a large dormer that either contains a chimney or joins two parts of a roof together. If you add a dormer to a room, the added light and new layout of the room will affect the electrical lighting needs. You may want to hire an electrician to rewire the room and install different lighting elements. One problem with dormers is that they are often made of cheaper and less-durable materials than the rest of the roof. This can lead to rotting and warping. Additionally, if not installed by a skilled, professional roofer, they may be poorly fastened to the roof and will allow leaks and drafts. In cities with cold climates like Detroit, Michigan, a cold draft can significantly boost heating bills. If it is not repaired, you may end up with interior wall and roofing damage – a much more expensive job than a dormer repair.